Background: Diverse tumors in the posterior third ventricular region (TPTVR) frequently occur in children. A decade's experience with pediatric TPTVR is presented, focusing on the Indian perspective. Materials and Methods: 25 children (age range: 3-18 years; mean age: 13.32 years; presentation range: 7 days-2.5 years) had clinico-radiological assessment with contrast computed tomography (CT) and magnetic resonance imaging (MRI). The ventricular/lumbar cerebrospinal fluid (CSF) alpha feto protein (AFP)/beta human chorionic gonadotrophin (HCG) estimation was done when radiological suspicion of a germ cell tumor was present. Extent of resection was deemed partial when some tumor mass remained at the end of surgery, near total when <10% was retained over vital neurovascular structures, and total when complete resection was attained. 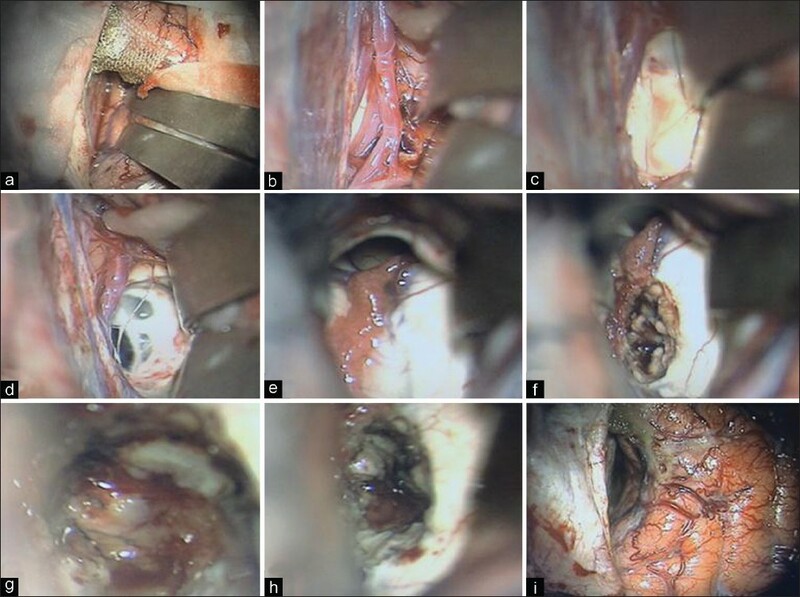 Results: Operations included infratentorial supracerebellar approach (n = 12), occipito-transtentorial approach (n = 2), endoscopic biopsy and third ventriculostomy (n = 1), frontal parasagittal craniotomy, interhemispheric transcallosal subchoroidal approach (n = 2), middle temporal gyrus transcortical transventricular approach (n = 1), fronto-temporo-zygomatic combined transylvian and subtemporal approach (n = 1) and right ventriculoperitoneal shunt and stereotactic biopsy (n = 1). Only CSF diversion was performed for five patients with a small TPTVR. CSF diversion was required in 12 (48%) patients. Tumor pathology included pinealoblastoma (n = 4; one with pineocytic differentiation), nongerminomatous germ cell tumor (NGGCT; n = 3), germinoma (n = 3), pilocytic astrocytoma (n = 2), epidermoid (n = 3) and primitive neuroectodermal tumor (PNET), fibrillary astrocytoma, glioblastoma, teratoma, and meningioma (n = 1, respectively). 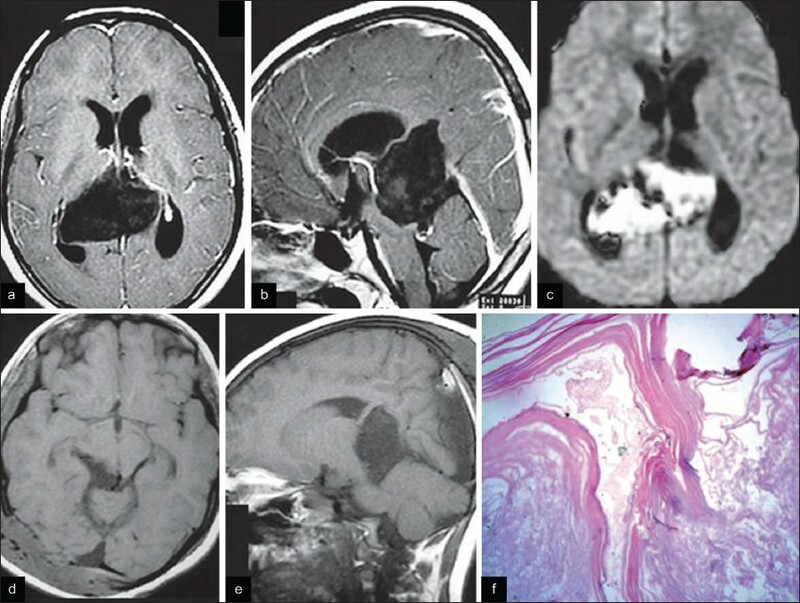 A patient with neurocysticercosis was diagnosed solely on MRI (four did not undergo biopsy). Fractionated radiotherapy was administered in 13 patients with primary pineal tumors, PNET, NGGCT, fibrillary astrocytoma and glioblastoma. Extent of excision was total in 10 (40%), near total in 5 (20%), partial in 3 (12%) and a biopsy in 2 (8%) patients. Conclusions: Histopathologic characterization of TPTVR is essential prior to their further management. Benign lesions often have a good prognosis following gross total surgical resection. Pure germinomas are highly susceptible to radiotherapy. NGGCTs often have malignant components that require adjuvant therapy following surgery. The advancements in microsurgical techniques have led to gratifying perioperative results in these deep-seated lesions. Tumors in the posterior third ventricular region (TPTVR) have a common anatomical location, yet present a diverse spectrum of histopathology, radiological characteristics, natural history and prognosis. ,,,,,, A proper categorization of these tumors into their histological subtypes considerably helps in effectively managing these lesions as well as in their prognostication. These tumors are rare, comprising less than 11% of all pediatric tumors. , In children, approximately 60% of pineal region tumors are of germ cell origin. A multimodality strategy consisting of surgery (total resection being possible in nearly 30% of tumors), radio- and chemotherapy, often encompassing minimally invasive techniques such as stereotactic biopsy, radiosurgery and endoscopic surgery, has considerably improved outcomes in these lesions. , In the present review, a decade's experience with TPTVR in the pediatric population is presented with a focus on the Indian perspective. Records of pediatric patients with TPTVR operated over the last decade were retrieved from their case files and operation theater register. Histology of the cases where surgical excision/biopsy was performed was confirmed from the histopathology reports. Their preoperative evaluation consisted of clinical and radiological assessment with contrast-enhanced computerized tomography (CECT) and gadolinium-enhanced magnetic resonance imaging (MRI). The ventricular/lumbar cerebrospinal fluid (CSF) was subjected to alpha feto protein (AFP)/human chorionic gonadotrophin (HCG) assessment when radiological suspicion of a germ cell tumor (GCT) was present. Extent of resection was deemed partial resection when some tumor mass remained at the end of surgery, near total when less than 10% was retained over vital neurovascular structures, and total when complete resection was attained. In this series of 25 pediatric patients, the age ranged from 3 to 18 years, with a mean age of 13.32 years. [Table 1] The male:female ratio was 19:6. The duration of presentation ranged from 7 days to 2.5 years. 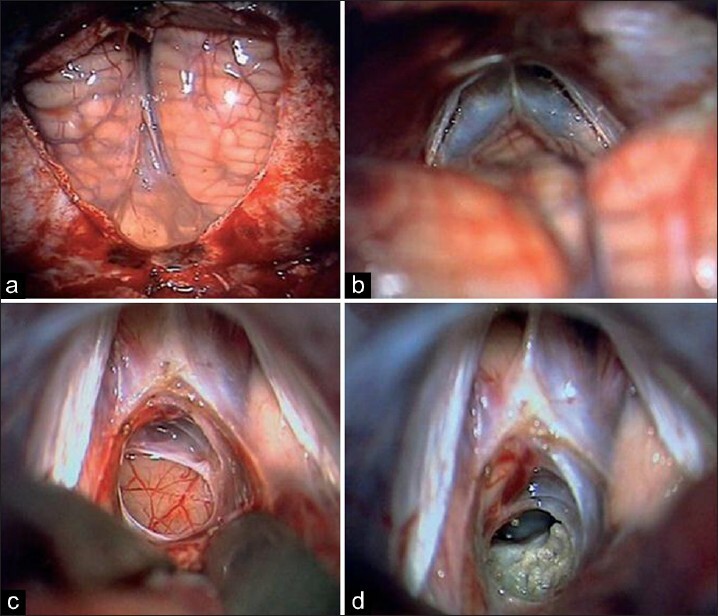 The procedures performed for accessing TPTVR included infratentorial supracerebellar approach (n = 12), right occipito-transtentorial approach (n = 2), endoscopic biopsy and third ventriculostomy (n = 1), right frontal parasagittal craniotomy, interhemispheric transcallosal subchoroidal approach (n = 2), right transcortical and transventricular approach through the middle temporal gyrus (n = 1), fronto-temporo-zygomatic craniotomy, combined transylvian and subtemporal approach (n = 1) and right ventriculoperitoneal shunt and stereotactic biopsy (n = 1). No definite procedure for the primary TPTVR was performed for five patients. The CSF diversion procedures were performed in 12 (48%) patients and included a biventriculoperitoneal shunt (n = 1), revision of blocked ventriculoperitoneal shunt (n = 1), revision of blocked third ventriculostomy by placement of a ventriculoperitoneal shunt (n = 1), a primary ventriculoperitoneal shunt (n = 5), third ventricle-supracerebellar cisternal shunt (n = 1) and an endoscopic third ventriculostomy (n = 3). Gross total excision of the tumor was performed in 10 (40%) patients. A near total excision was performed in 5 (20%), partial excision in 3 (12%) and a biopsy in 2 (8%) patients. No definitive surgery for the primary tumor was performed in 5 (20%) patients with a small TPTVR causing aqueductal obstruction, who received a CSF diversion procedure for hydrocephalus. The latter are on a regular follow-up with a serial assessment of the size of their primary tumor. 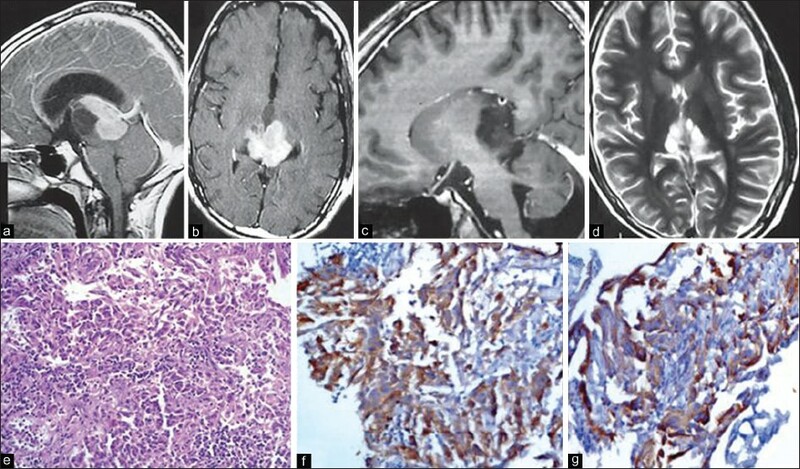 The tumor pathology included the following: Pinealoblastoma (n = 4; one with pineocytic differentiation) [Figure 1] and [Figure 2], nongerminomatous GCT (NGGCT; n = 3) [Figure 3], germinoma (n = 3) [Figure 4] and [Figure 5], primitive neuroectodermal tumor (PNET, n = 1) [Figure 6], pilocytic astrocytoma (n = 2) [Figure 7], fibrillary astrocytoma (n = 1), [Figure 8] and [Figure 9], glioblastoma (n = 1) [Figure 10], teratoma (n = 1) [Figure 11], epidermoid (n = 3) [Figure 12] and [Figure 13] and meningioma (n = 1) [Figure 14]. 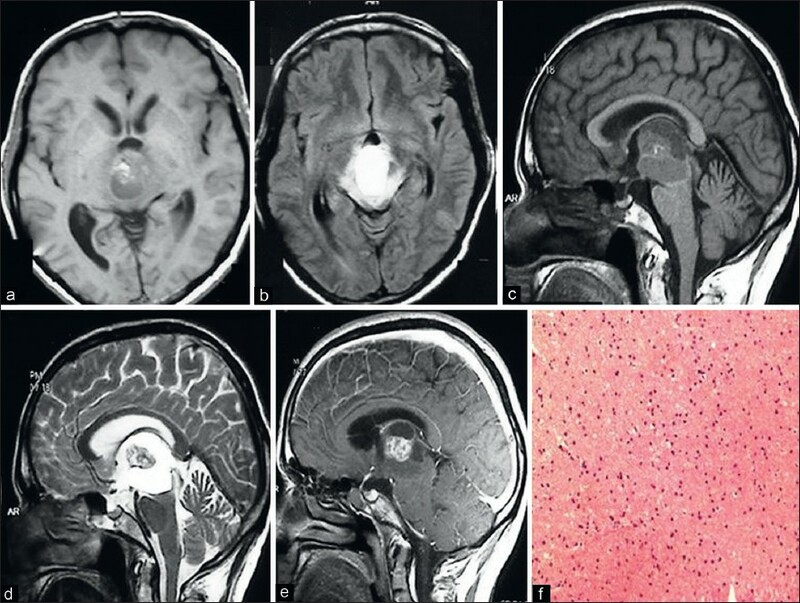 A patient with neurocysticercosis was diagnosed solely on MRI [Figure 15]. Four other patients did not undergo biopsy for their primary tumor. Fractionated radiotherapy was administered in 13 patients with primary pineal tumors, PNET, NGGCT, fibrillary astrocytoma and glioblastoma. Following surgery, there was increase in ataxia, postoperative mutism, CSF leak through operative wound and pseudomeningocele formation in one patient each, respectively. One patient did not improve from the preoperative status of spontaneous eye opening, spontaneous limb movement and not following commands. There was no mortality in the series. TPTVR may be divided into four diverse groups: Pineal parenchymal tumors, GCTs, glial tumors and miscellaneous tumors. , In our pediatric series, we had a heterogeneous mix of the characteristic histopathologic spectrum of TPTVR. Pineal parenchymal tumors [Figure 1] and [Figure 2] include the entire range from the benign and well-differentiated pineocytoma to the malignant and aggressive pinealoblastoma and the intermediate-grade mixed pineal tumors (including the pinealoblastoma with pineocytic differentiation) interspersed in between. 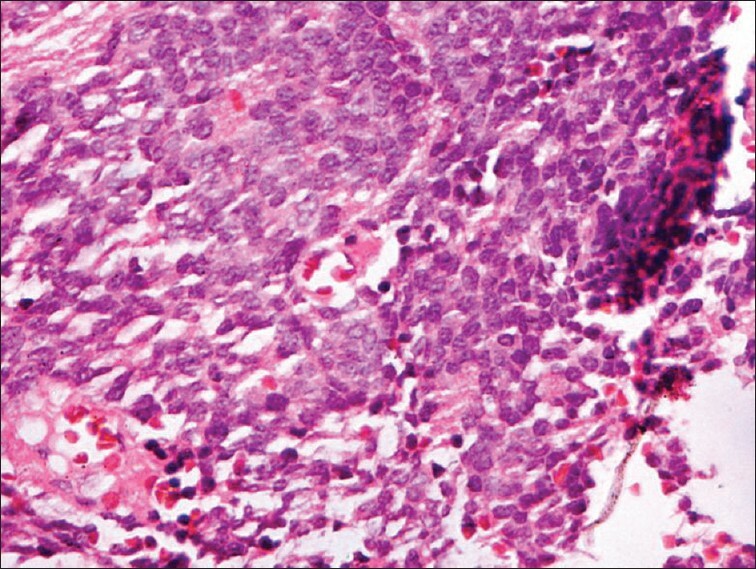 Pineocytomas are well-differentiated, moderately cellular neoplasms composed of relatively small, uniform, mature appearing pineocytes often forming large pineocytomatous rosettes. They show strong immunoreactivity for synaptophysin, neuron specific enolase (NSE) and neurofilament protein (NFP). They behave more aggressively in children than in adults. Gross total resection or radiosurgical treatment often results in long-term tumor-free survival without additional adjuvant therapy. , In our pediatric patients, a pure pineocytoma was not seen although one patient had an intermediate-type pinealoblastoma with pineocytic differentiation. GCTs include two categories: (a) germinomas and (b) NGGCT such as endodermal sinus tumors, choriocarcinomas, embryonal carcinomas and mature and immature teratomas [Figure 3]. , They represent the malignant correlate of a normal embryonic stage of development: The primordial germ cell (germinoma), the embryonic differentiated derivative (teratoma) of the pluripotential stem cell of the embryo proper (embryonal carcinoma), as well as the extraembryonic differentiated derivatives which form the yolk sac endoderm (endodermal sinus tumor) and trophoblast (choriocarcinoma). , Central nervous system variants, like the other extragonadal GCT sites, preferentially affect the midline. Eighty percent or more arise in structures approximating the third ventricle, with the region of the pineal gland being their most common site of origin. NGGCTs usually have mixed histological patterns and a pure individual histology is rarely encountered [Figure 3]. A yolk cell tumor (endodermal sinus tumor) is composed of primitive appearing epithelial cells representing yolk sac endoderm. These are set in a loose, variably cellular and often conspicuously myxoid matrix resembling extra-embryonic mesoblast. 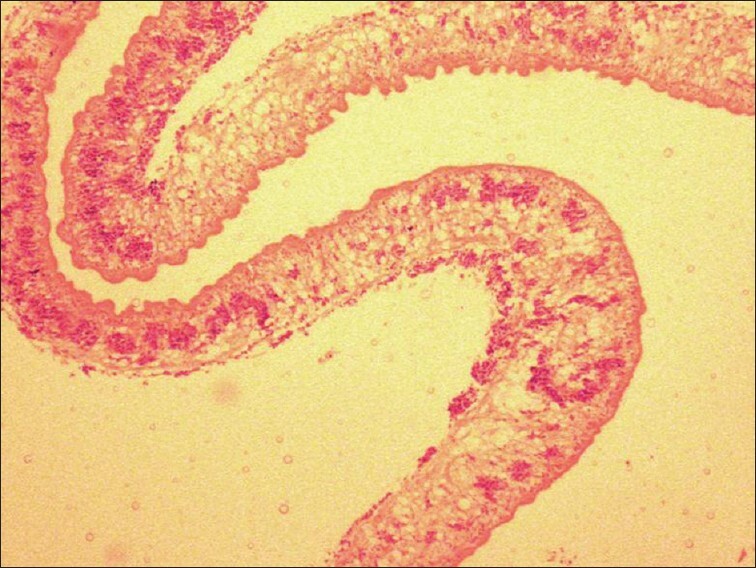 They show Schiller-Duval Bodies More Details and may contain polyvescicular vitelline or reticular pattern. 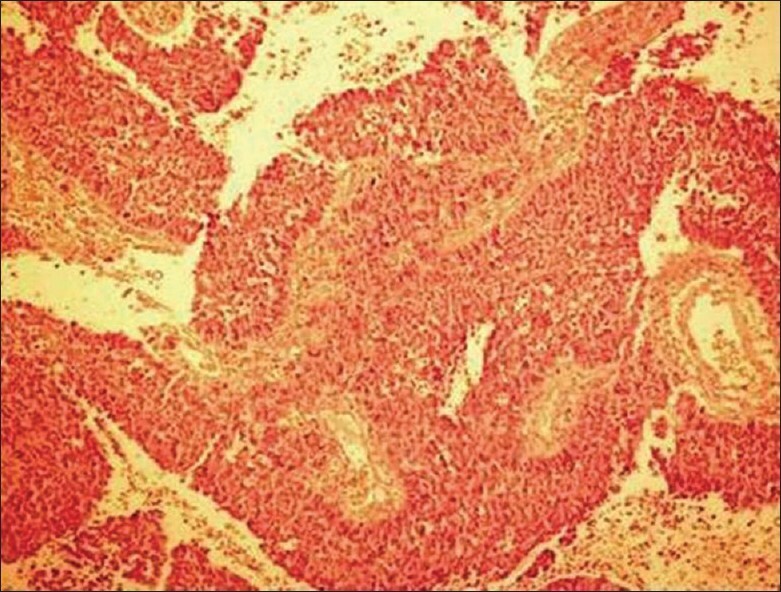 A diagnostic, although inconsistent, feature is the presence of periodic acid Schiff positive and diastase-resistant hyaline globules that may appear in the cytoplasm of the epithelial cells or may be seen free in the adjoining stroma. They show positivity with AFP and are characteristically non-reactive for c-kit and OCT4. Hyaline globules of this tumor are also AFP positive. An embryonal carcinoma is composed of solid sheets of undifferentiated cells or show sign of early differentiation toward embryonic structures, trophoblasts, or extraembryonic endoderm or mesoderm in the form of papillary or granular formation. They show positivity for CD30 and cytokeratin. The choriocarcinoma is characterized by extra-embryonic differentiation along trophoblastic lines. The diagnosis requires the identification of cytotrophoblastic elements and syntrophoblastic giant cells. Syntrophoblastic giant cells' immunoreactivity for β-HCG and HPL is characteristic. 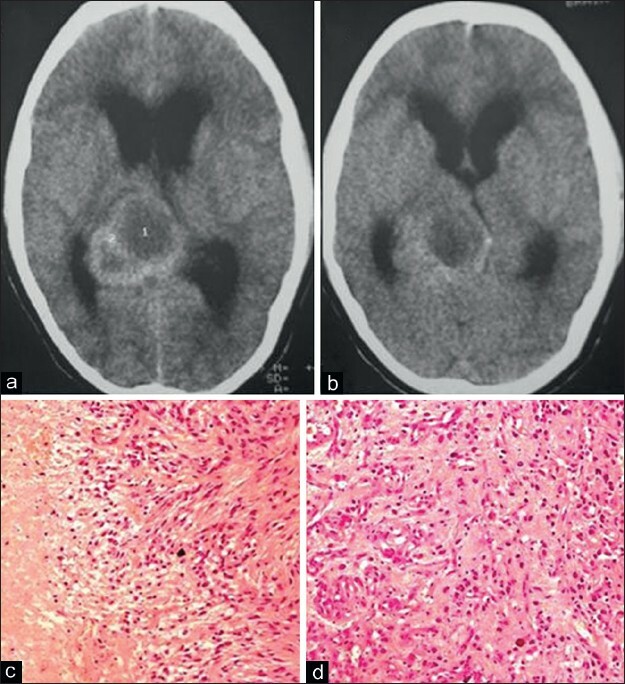 The miscellaneous lesions in this location include meningiomas [Figure 14],  pineal cysts (cystic structures surrounded by normal pineal parenchymal tissue),  epidermoids [Figure 12] and [Figure 13] and dermoids, ,,, parasitic cysts [Figure 15], hemangiopericytomas, lymphomas, choroid plexus papillomas, adenocarcinomas, metastasis [Figure 16], atypical teratoid-rhabdoid tumor and chemotectomas. Some rare tumors have been reported in the Indian literature. Ghosal et al., have described a sporadic case of pinealoblastoma with prominent retinoblastic differentiation in whom the tumor showed a PNET with numerous Flexner-Wintersteiner rosettes and the tumor cells were strongly positive for synaptophysin and negative for glial fibrillary acidic protein (GFAP), S-100 protein and epithelial membrane antigen. Husain et al., have described a rare pineal papillary glioneuronal tumor. 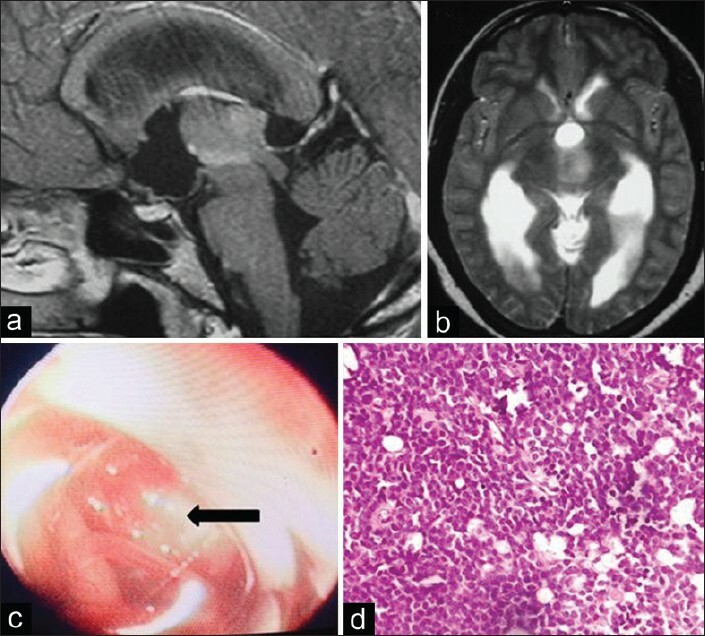 Srinivas and colleagues have reported a rare pleomorphic xanthoastrocytoma in this region. Sharma et al.,  and Vaghela et al.,  have described papillary tumors of the pineal region, consisting of both solid and papillary areas with immunohistochemistry showing strong and diffuse positivity for synaptophysin, NSE, chromogranin A, S-100 protein, microtubule associated protein (MAP)-2 and cytokeratin. In all these miscellaneous lesions, the choice of surgical decompression/adjuvant radio-chemotherapy is dictated by the histology of the lesion. MRI with contrast enhancement helps in identifying the type of tumor (the uniform enhancement of a germinoma;  the nonenhancing, irregular lesion infiltrating into multiple cisterns without mass effect signifying the presence of an epidermoid; ,, the rounded, nonenhancing cystic neurocysticercus cyst;  the diffusely infiltrative, irregularly and minimally enhancing astrocytoma; the evidence of hemorrhage and calcification in pineocytomas/pinealoblastomas, etc.). However, for a majority of primary pineal and GCTs, the MR picture is not diagnostic, and therefore a tissue biopsy becomes mandatory unless the serum markers are pathognomonic. , MRI also helps in deciding whether the surgical approach to be used is supra or infratentorial based upon the superior or inferior displacement of the deep venous system by the tumor. The degree of infiltration into the brain stem, the ventricular ependyma or the hypothalamus often helps in predicting the degree of resectability of the lesion. The midline trajectory of the approach to the tumor avoids injury to the deep venous channels that usually are located superior to the lesion. The approach is toward the center of the tumor from where it may be extended eccentrically. There is a good exposure with minimal neural damage. The sitting position offers a good exposure with gravity-assisted drainage of blood and CSF. Lesions with a significant component extending laterally until the trigone of the lateral ventricle or lesions involving the corpus callosum are difficult to remove completely by this trajectory and require supratentorial approaches. The sitting position in which this surgery is usually performed increases the risk of air embolism, tension pneumocephalus and cervical hyperflexion injury leading to quadriplegia. The sitting position is the preferred position for this approach although a three-fourth prone or lateral decubitus position has also been used. The latter positions are used in the pediatric age group, particularly under 2 years of age. The head in the sitting position must be adequately flexed to align the tentorium in the horizontal position for an adequate exposure of the supra-vermian infratentorial space. A midline vertical incision extending from the C3 spinous process to 2-3 cm above the external occipital protuberance is utilized. The muscles of the suboccipital and posterior cervical region are retracted after dividing the avascular ligamentum nuchae in the midline. The pericranium covering the occipital bone is dissected off the bone. The suboccipital craniectomy or craniotomy exposes the rim of the torcula and the transverse sinus superiorly and reaches inferiorly until the foramen magnum. The dura is opened in a "V" or "Y" manner with the base toward the transverse sinus. In case the surgical field of view is not adequate, the bridging veins from the dorsal cerebellar surface to the tentorium may be sacrificed to permit gravity-dependent descent of the cerebellum. 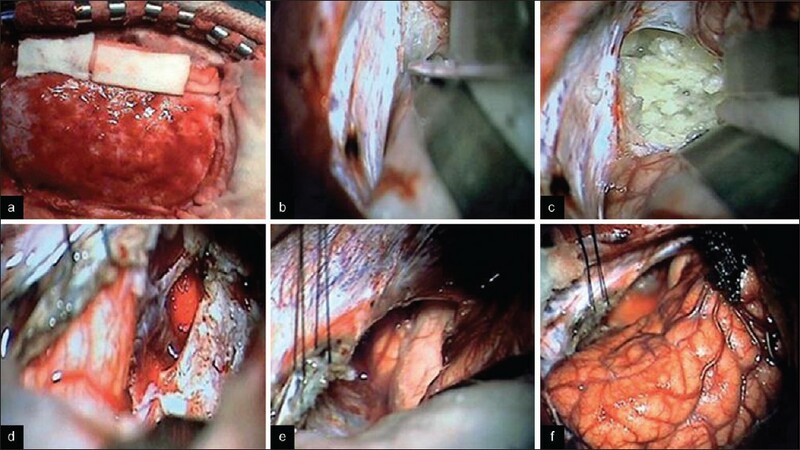 Gentle retraction with self-retaining retractors aids in depressing the cerebellum for establishment of the operative corridor between its superior vermian surface and the inferior surface of tentorium. The arachnoid of the quadrigeminal cistern is thickened and opaque. The midline pre-central cerebellar vein traversing vertically downward in the midline just anterior to the thickened arachnoid may either be retracted or coagulated. This permits a trajectory toward the quadrigeminal cistern, velum interpositum, collicular plates and the third ventricle. Once the tumor is encountered, internal decompression is done followed by careful dissection from the surrounding structures including the deep venous system superiorly and the brain stem, collicular plates and the thalamus anteriorly. Following tumor decompression, the third ventricular cavity and the lining ependyma is well visualized right until the foramen of Monro. In the case of dense adhesions of the tumor capsule to the surrounding vital structures, it is preferable to leave parts of the capsule than risk retraction injury by persisting with its complete removal. In patients with significant hydrocephalus, a preoperative CSF diversion procedure may be employed prior to the definitive surgery. Postoperative complications include CSF leak and acute or delayed hemorrhage. This may be due to bleeding within the residual tumor. Alternatively, a point of bleeding may be missed during hemostasis due to gravity-dependent collapse of the bridging veins in sitting position. The rent may open up in the postoperative period when the patient is made supine and his/her blood pressure increases on reversal from anesthesia. Hemorrhagic venous infarction may also occur due to coagulation of a bridging vein. The patient is placed in prone position or lounging position. In prone position, the table is slightly tilted to the ipsilateral side to facilitate gravity-dependent retraction of the occipital lobe from the falx cerebri. A square or triangular scalp flap with the longitudinal limb being in the midline and extending from just below the external occipital protuberance to 6-8 cm superior to this point and curving laterally and downward is used. Preferably, the approach is carried out from the non-dominant side. The craniotomy is fashioned to expose the rim of the transverse sinus inferiorly, the superior sagittal sinus medially and it extends laterally for 5-6 cm. The dural opening may be as two triangular flaps with the base toward the transverse and sagittal sinuses, respectively, or as a square flap medially toward the superior sagittal sinus. In case hydrocephalus is coexistent, the occipital horn/trigone of the lateral ventricle may be tapped to facilitate CSF drainage and brain retraction. The occipital lobe is gently retracted laterally. This maneuver is facilitated by the fact that bridging veins between the parieto-occipital cerebral surface and the superior sagittal sinus are few and small and may usually be divided with very little risk of venous infarction of the occipital lobe. The falx cerebri, the tentorium, and the dural covering of the straight sinus at the junctional region of these dural folds are visualized from the region of the torcula to the tentorial incisura. The tentorium is coagulated parallel and lateral to the straight sinus (avoiding any venous lakes in close proximity to the straight sinus) and divided until the incisural edge, thereby bringing the superior cerebellar surface in view. The divided leaflets of the tentorium are reflected using stay sutures. The opaque and tough arachnoid over the deep veins is left intact if the tumor is below their level. Working in the arachnoidal plane below the major veins, lesion of the posterior third ventricular regions is exposed. The tumor removal is then carried out in a piecemeal manner. Following tumor removal, the brain stem, the collicular plate and the posterior thalamic regions are well visualized. Adequate exposure both above and below the tentorial notch is available. Lesions reaching until the trigone and corpus callosum are accessible. This approach is specially preferred in cases where the deep venous system is dorsally displaced as occurs in tentorial meningiomas. In tumors extending eccentrically to the contralateral side, complete removal is difficult. Care must be taken to avoid damage to the occipital lobe (that may precipitate homonymous hemianopia) and the splenium of corpus callosum (that may result in posterior disconnection syndrome). Regardless of the approach, Perinaud's syndrome with upward gaze palsy, pupillary and accommodation abnormalities with partial or complete oculomotor nerve palsy, trochlear nerve injury with diplopia or even alteration of sensorium due to brain stem injury may result. Alternative approaches may be utilized to access pineal region lesions. ,, The posterior interhemispheric transcallosal approach utilizes a parietal, interhemispheric approach to gain access to the lesions situated above the major venous structures and involving the posterior corpus callosum. The anterior transcallosal, transventricular approach [Figure 9] is useful when the tumor occupies the lateral ventricles or the anterior third ventricle also along with the pineal region. It utilizes the conventional anterior interhemispheric approach to gain access into the lateral ventricle by creating a small opening in the corpus callosum. The access from the lateral to the third ventricle is gained by a subchoroidal approach or an approach medial to the choroid plexus, by dividing the thin velum interpositum that is encountered, and by following a trajectory that is directed posteriorly toward the pineal region infero-lateral to the internal cerebral veins traversing the roof of the third ventricle. Alternatively, after the corpus callosum is divided, the transcallosal interforniceal approach permits direct entry into the third ventricle by separating the fornices in the midline. The lateral paramedian infratentorial approach in park-bench position traverses between the superior surface of cerebellar hemisphere and the lateral tentorium. The trajectory is directed superomedially toward the tentorial incisura. The bridging veins traversing this corridor may be divided to gain additional space. Stereotactic or endoscopic biopsy may also be utilized to identify lesions that have an excellent response to radio- and chemotherapy, thus avoiding the need for a major surgery. In two patients in this series, two surgical trajectories that have not been categorized as being part of the conventional approaches for TPTVR were utilized. In the first case, a cystic brain stem pilocytic astrocytoma extended to the posterior third ventricular region. This was easily accessible though the frontotemporal zygomatic craniotomy and transylvian and subtemporal, transtentorial approach to the lateral brain stem. The IV nerve entering the tentorial edge was meticulously preserved and the cystic tumor decompressed via the lateral surface of the brain stem. In another patient, the PNET was infiltrating the posterior thalamus, internal capsular region and medial wall of the lateral ventricular trigone and extended until the posterior third ventricular region. This was a soft suckable lesion situated predominantly lateral to the third ventricle and causing a midline shift. It could be accessed by the transcortical, transventricular approach with the initial corticectomy through the middle temporal gyrus. Management of hydrocephalus: Whether or not to treat the primary lesion? In case there is no hydrocephalus, and especially, if spinal seeding is also detected on preoperative MRI, then lumbar CSF may be obtained for tumor marker study as well as for malignant tissue cytology. Tumor types such as pinealoblastomas, ependymomas and germinomas that may spread along CSF pathways may especially require a lumbar CSF examination to confirm a "drop metastasis." Obtaining a tissue diagnosis is mandatory for management of TPTVR. ,, In four of our patients, however, who had a very small posterior third ventricular lesion and were symptomatic due to hydrocephalus consequent to aqueductal stenosis, only a CSF diversion was performed. These patients have been placed on a regular follow-up rather than subjecting them to the risk of an invasive procedure to obtain a histopathologic specimen. Any growth of the primary lesion at follow-up will immediately warrant a definitive interventional procedure in them. TPTVR are frequently encountered in children. Their histopathologic characterization is essential due to their diverse spectrum and the failure of imaging techniques to unequivocally differentiate between them. Benign lesions are often amenable to a long-term tumor-free interval following gross total surgical resection. Pure germinomas are highly susceptible to radiotherapy. NGGCTs often have malignant components that require adjuvant therapy following surgery. The advancements in microsurgical techniques have led to extremely gratifying perioperative results in these deep-seated lesions. We gratefully acknowledge the permission given by the publishers and editors of Journal of Pediatric Neurosciences for permitting us to use parts of our previous publication (Behari S, Garg P, Jaiswal S, Nair A, Naval R, Jaiswal AK. Major surgical approaches to the posterior third ventricular region: A pictorial review. J Pediatr Neurosci 2010;5:97-101) in this article. 1. Hoffman HJ, Yoshida M, Becker LE, Hendrick EB, Humphreys RP. Pineal region tumors in childhood. Experience at the Hospital for Sick Children. 1983. Pediatr Neurosurg 1994;21:91-103; discussion 104. 2. Kumar P, Tatke M, Sharma A, Singh D. Histological analysis of lesions of the pineal region: A retrospective study of 12 years. Pathol Res Pract 2006;202:85-92. 3. Arivazhagan A, Anandh B, Santosh V, Chandramouli BA. Pineal parenchymal tumors-utility of immunohistochemical markers in prognostication. Clin Neuropathol 2008;27:325-33. 4. Chandy MJ, Damaraju SC. Benign tumours of the pineal region: A prospective study from 1983 to 1997. Br J Neurosurg 1998;12:228-33. 5. Dastur DK, Lalitha VS. Pathological analysis of intracranial space-occupying lesions in 1000 cases including children. 2. Incidence, types and unusual cases of glioma. J Neurol Sci 1969;8:143-70. 6. Bruce JN, Ogden AT. Surgical strategies for treating patients with pineal region tumours. J Neurooncol 2004;69:221-36. 7. Behari S, Garg P, Jaiswal S, Nair A, Naval R, Jaiswal AK. Major surgical approaches to the posterior third ventricular region: A pictorial review. J Pediatr Neurosci 2010;5:97-101. 8. Bruce JN. Pineal Tumors. In: Winn H, editor. Youman's Neurological Surgery. 1st ed. Philadelphia: WB Saunders; 2004. p. 1011-29. 9. D'Andrea AD, Packer RJ, Rorke LB, Bilaniuk LT, Sutton LN, Bruce DA, et al. 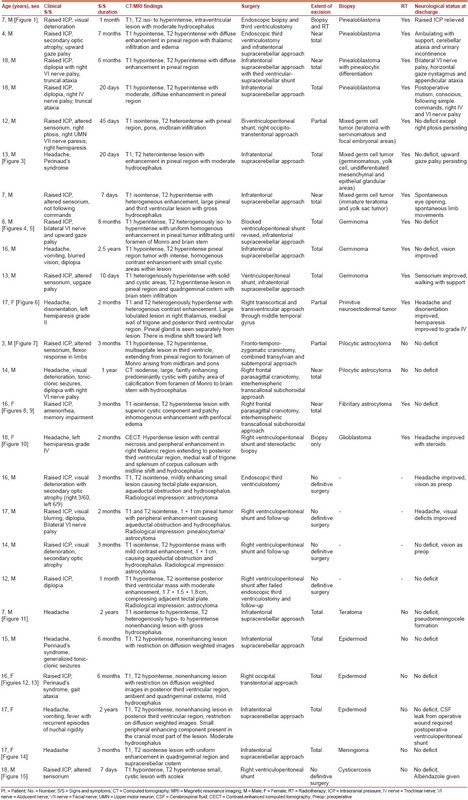 Pineocytomas of childhood: A reappraisal of natural history and response to therapy. Cancer 1987;59:1353-7. 10. Jennings MT, Gelman R, Hochberg F. Intracranial germ cell tumors: Natural history and pathogenesis. J Neurosurg 1985;63:155-67. 11. Tandon N, Chopra R, Ghoshal S, Singh P, Sharma BS. 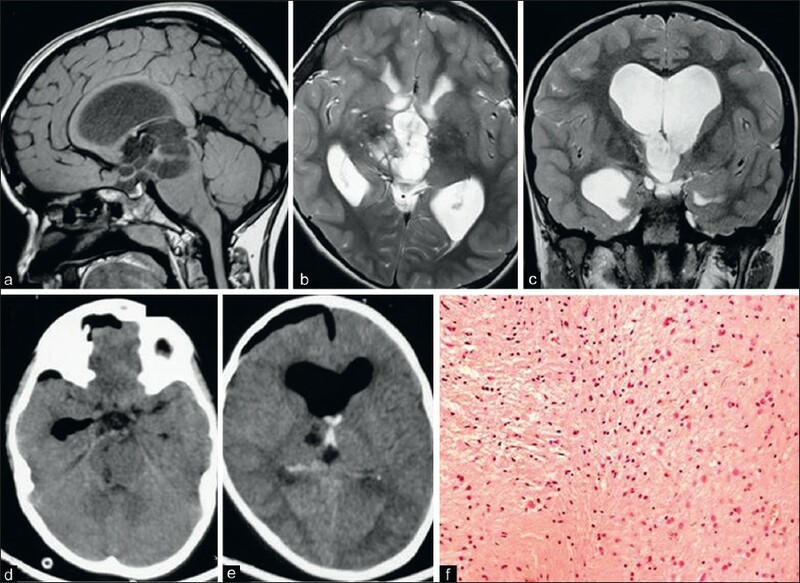 Mixed germ cell tumour of the pineal region: A case report. Neurol India 1999;47:321-3. 12. Matsutani M, Sano K, Takakura K, Fujimaki T, Nakamura O, Funata N, et al. Primary intracranial germ cell tumors: A clinical analysis of 153 histologically verified cases. J Neurosurg 1997;86:446-55. 13. Mohanty SC, Das AK, Tripathy B, Mohanty G, Bhagat S, Mishra S. Germinoma of the pineal gland. Neurol India 2003;51:286-7. 14. Sawamura Y, de Tribolet Ishii N, Abe H. Management of primary intracranial germinomas: Diagnostic surgery or radical resection? J Neurosurg 1997;87:262-6. 15. Sawamura Y, Kato T, Ikeda J, Murata J, Tada M, Shirato H. Teratomas of the central nervous system: Treatment considerations based on 34 cases. J Neurosurg 1998;89:728-37. 16. Moiyadi A, Jalali R, Kane SV. Intracranial growing teratoma syndrome following radiotherapy-An unusually fulminant course. Acta Neurochir (Wien) 2010;152:137-42. 17. Kochi M, Itoyama Y, Shiraishi S, Kitamura I, Marubayashi T, Ushio Y. Successful treatment of intracranial nongerminomatous malignant germ cell tumors by administering neoadjuvant chemotherapy and radiotherapy before excision of residual tumors. J Neurosurg 2003;99:106-14. 18. Barnett DW, Olson JJ, Thomas WG, Hunter SB. Low grade astrocytomas arising from the pineal gland. Surg Neurol 1995;43:70-5. 19. Konovalov AN, Spallone A, Pitzkhelauri DI. Meningioma of the pineal region: A surgical series of 10 cases. J Neurosurg 1996;85:586-90. 20. Desai KI, Nadkarni TD, Fattepurkar SC, Goel AH. Pineal epidermoid cysts: A study of 24 cases. Surg Neurol 2006;65:124-9. 21. Muzumdar D, Balasubramanian S, Goel A. Tonsillar herniation and cervical syringomyelia due to postoperative meningitis in case of pineal region epidermoid. Pediatr Neurosurg 2009;45:56-60. 22. Kawal P, Kumar R. Epidermoid cyst in quadrigeminal cistern presenting with mutism. J Pediatr Neurosci 2010;5:160-3. 23. Ghosal N, Furtado SV, Hegde AS. Pinealoblastoma with prominent retinoblastic differentiation: An unusual case in an adult. Neuropathology 2010;30:439-42. 24. Husain N, Husain M. Endoscopic diagnosis of a pineal papillary glioneuronal tumor with extensive ventricular involvement: Case report with review of literature. Neurol India 2009;57:792-5. 25. Srinivas BH, Uppin MS, Panigrahi MK, Vijaya Saradhi M, Jyotsna Rani Y, Challa S. Pleomorphic xanthoastrocytoma of the pineal region. J Clin Neurosci 2010;17:1439-41. 26. Sharma MC, Jain D, Sarkar C, Suri V, Garg A, Sharma BS, et al. 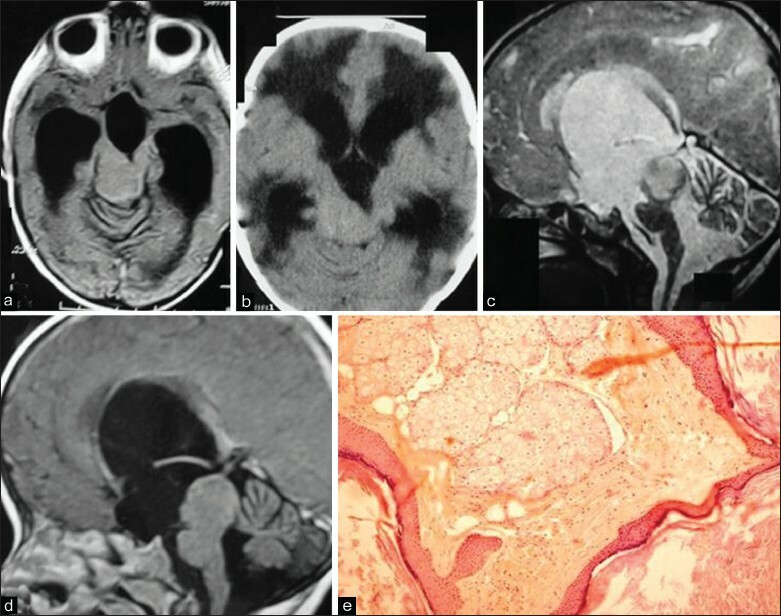 Papillary tumor of the pineal region-a recently described entity: A report of three cases and review of the literature. Clin Neuropathol 2009;28:295-302. 27. Vaghela V, Radhakrishnan N, Radhakrishnan VV, Menon G, Kesavadas C, Thomas B. Advanced magnetic resonance imaging with histopathological correlation in papillary tumor of pineal region: Report of a case and review of literature. Neurol India 2010;58:928-32. 28. Santosh IP, Rajshekhar V. Galactorrhea as the sole presenting symptom of a posterior third ventricular epidermoid cyst. Surg Neurol 2001;55:46-9. 29. Haque F, Zahid M, Ahmad SA, Naseem S. Synchronous germinomas in the pineal and suprasellar region. Indian Pediatr 2005;4:376-9. 30. Oppenheim H, Krause F. [Operative Erfloge bei Geschwulsten der Sehh ugel-und Vierhugelgeggend]. Berl Klin Wochenschr 1913;50:2316-22. 31. Bruce J, Stein B. Supracerebellar approaches in the pineal region. In: Apuuzzo M, editor. Brain Surgery: Complication avoidance and management. New York: Churchill Livingstone; 1993. p. 511-36. 32. Jamieson KG. Excision of pineal tumors. J Neurosurg 1971;35:550-3. 33. Poppen JL, Marino R Jr. Pinealomas and tumors of the posterior portion of the third ventricle. J Neurosurg 1968;28:357-64. 34. Van Wagenen WP. A surgical approach for the removal of certain pineal tumors. Report of a case. Surg Gynecol Obstet 1931;53:216-20. 35. Dandy W. An operation for the removal of pineal tumors. Surg Gynecol Obstet 1921;33:113-9. 36. Sharma BS, Singh M. Surgical approaches to tumors of the posterior third ventricular region. In: Banerji D, Pauranik A, editors. Progress in clinical neurosciences. New Delhi: Byword Books Private Limited; 2010. p. 118-28. 37. Sano K. Pineal and posterior third ventricular tumors: A surgical review. In: Apuzzo ML, editor. Surgery of the third ventricle. Baltimore: William and Wilkins; 1998. p. 486-91. 38. Lapras C, Patet JD, Mottolese C, Lapras C Jr. Direct surgery for pineal tumors: Occipital transtentorial approach. Prog Exp Tumor Res 1987;30:268-80. 39. Sano K. Alternate surgical approaches to posterior third ventricular region neoplasms. In: Schmidek HH, editor. Operative neurosurgical techniques-indications, methods and results. Philadelphia: WB Saunders; 2000 p. 896-7. 40. Roopesh Kumar SV, Mohanty A, Santosh V, Satish S, Devi BI, Praharaj SS, et al. Endoscopic options in management of posterior third ventricular tumors. Childs Nerv Syst 2007;23:1135-45. 41. Husain M, Jha D, Thaman D, Husain N, Gupta RK. Ventriculostomy in a tumor involving the third ventricular floor. Neurosurg Rev 2004;27:70-2. 42. Kreth FW, Schätz CR, Pagenstecher A, Faist M, Volk B, Ostertag CB. Stereotactic management of lesions of the pineal region. Neurosurgery 1996;39:280-9; discussion 289-91. 43. Padma MV, Jacobs M, Kraus G, McDowell P, Satter M, Adineh M, et al. Radiation-induced medulloblastoma in an adult: A functional imaging study. Neurol India 2004;52:91-3. 44. Herrmann HD, Winkler D, Westphal M. Treatment of tumours of the pineal region and posterior part of the third ventricle. Acta Neurochir (Wien) 1992;116:137-46. 45. Balmaceda C, Heller G, Rosenblum M, Diez B, Villablanca JG, Kellie S, et al. Chemotherapy without irradiation: A novel approach for newly diagnosed CNS germ cell tumors: Results of an international cooperative trial. The first central nervous system germ cell tumor study. J Clin Oncol 1996;14:2908-15. 46. Raco A, Raimondi AJ, D'Alonzo A, Esposito V, Valentino V. Radiosurgery in the management of pediatric brain tumors. Childs Nerv Syst 2000;16:287-95. 47. Gnanadurai A, Purushothamam L, Rajshekhar V, Choudhury R, Ravindran P. Stereotactic radiosurgery for brain lesions: An observation and follow-up. J Neurosci 2004;36:225-7.